Back in August, we were on our usual summer organizing roll around our house. It always feels so good to get things organized again. 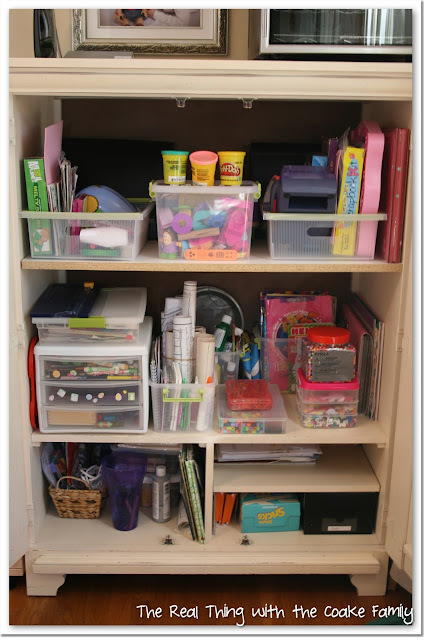 I have some organizing ideas for you today. Today I have office organizing ideas and craft organizing ideas as well. Our office/craft room is what is supposed to be our formal dining room. 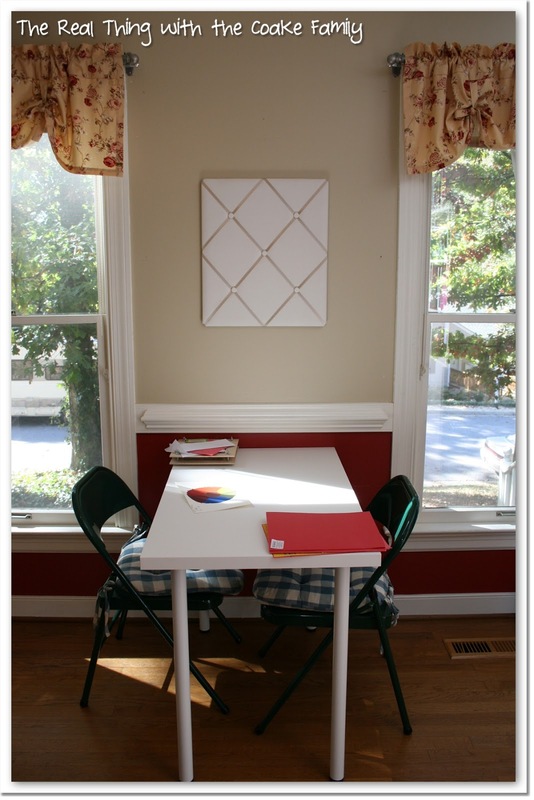 We would use it a couple of days a year as a formal dining room (if that), so we use it as our office and our craft room. It works really well for us. However, it had gotten to be so disorganized it just wasn't working and was always a mess. As it is on the first floor and I am in there a lot or walk by it about 50 times a day, it was bugging me big time! I got to work and tried something completely different this year. It has worked SO well for us. We have been keeping this organized for 2 months now and it is still looking good! Yippee! 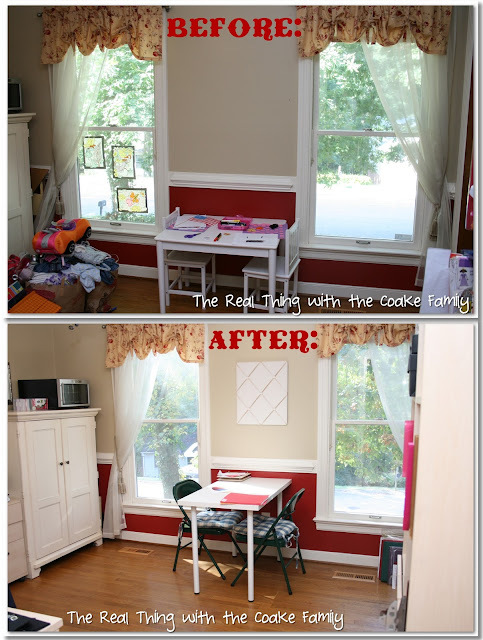 I decided to move the kid's craft supplies and our office things around completely. 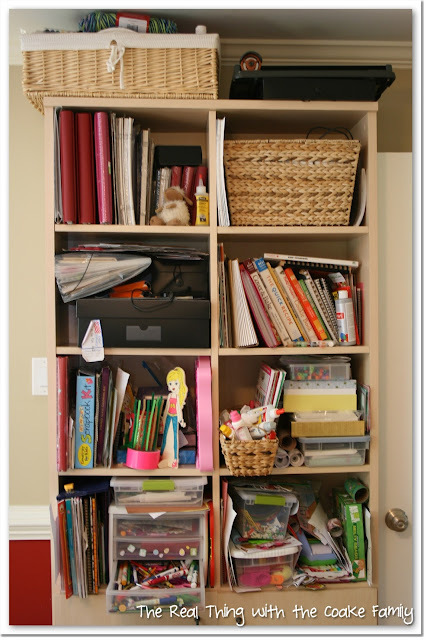 What was kid's craft supplies, photos and office stuff is now only office and photo stuff. What was office stuff became all crafts and some scrapbook/photo supplies. About a month ago, while at IKEA, we decided our girls are getting bigger and the small craft table was too small for them now. (In the before picture above, you can see a small bit of our giveaway pile from our playroom organization. )We got the table you see in the ‘after' picture for about $25! Love that! I need to get them new chairs, but for now the folding chairs are fine. So let's dig in and look more closely at what I did so I can give you some ideas and tips. 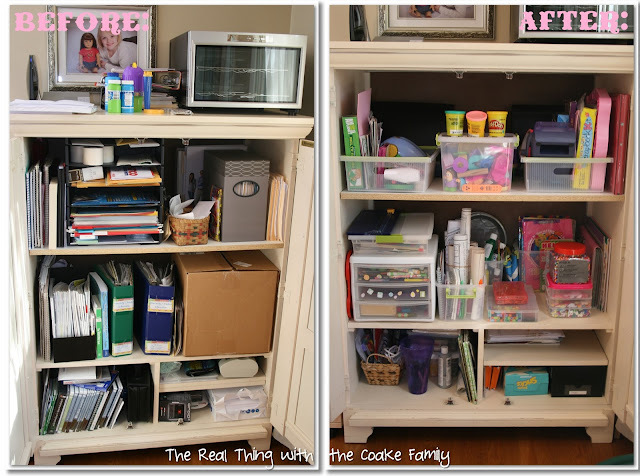 All I can say is: “Yuck!” The cabinet is overstuffed and the organization is just not working in the slightest. You can see how it looked after I organized it last year in this post. Same here. 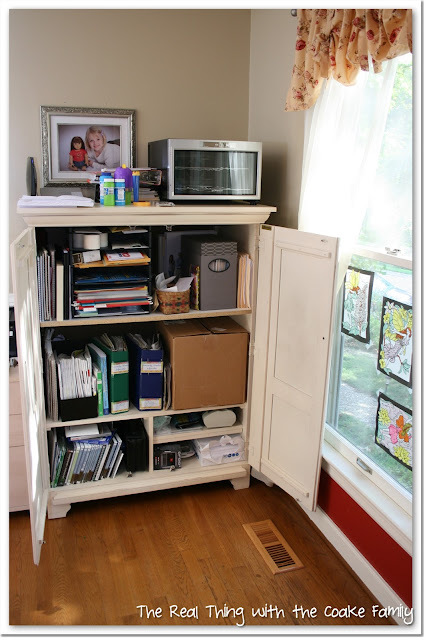 This cabinet was a TV armoire that we re-purposed when we bought a flat screen T.V. 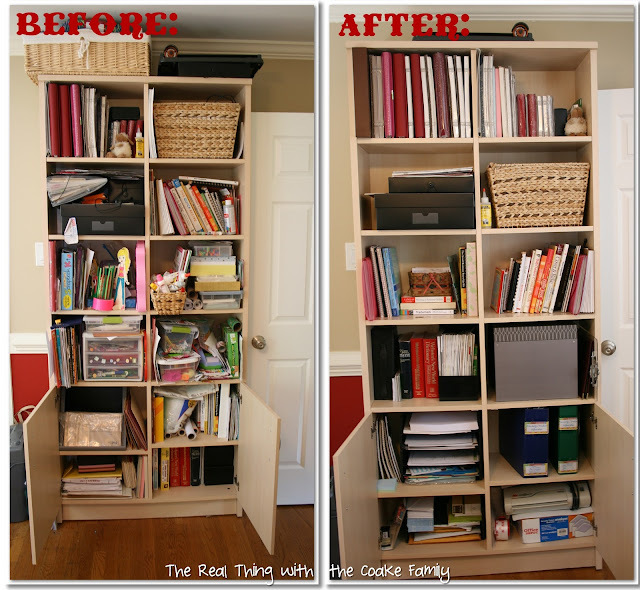 It is pretty deep and that can make organizing it a bit of a challenge. I decided to try swapping the two areas this year. If nothing else, I thought, I could close the doors on the girls craft messes and not have to look at them every day. As with any organizing project, I always start by emptying everything out. Looking through everything and purging as I go. I realized I needed to be ruthless if I wanted things to look nice and have any hope of them remaining organized. Um, yeah…what to say. 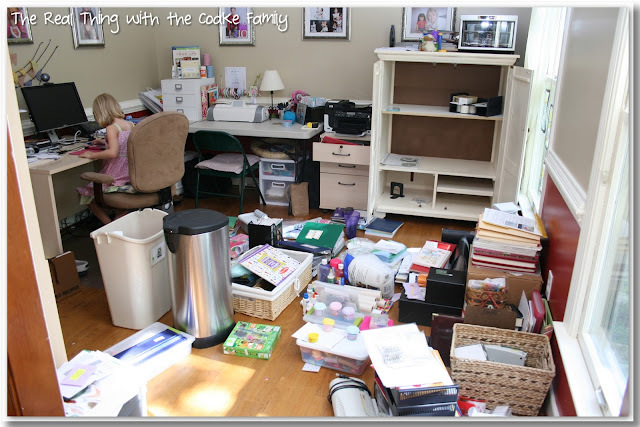 It looks like a huge mess….and it is. This is mid way through the project. Everything is out, sorted and purged. All of that has to find a home in the two cabinets again. I feel like a superhero when I am able to make it work! 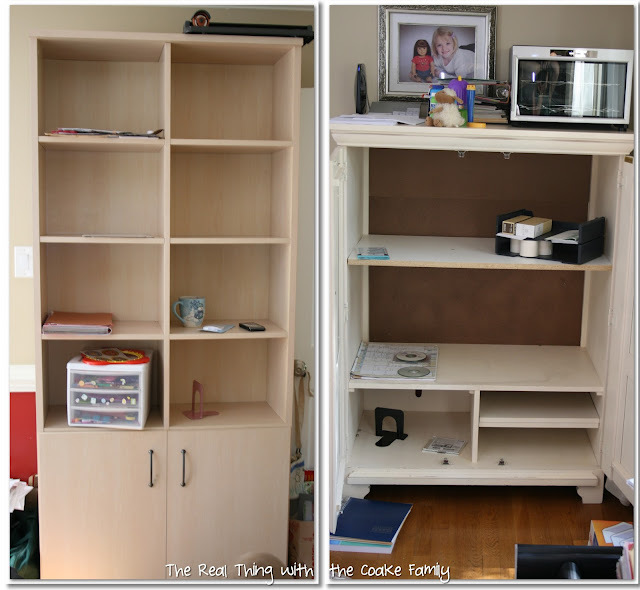 I thought you might like to see a closer look at the cabinets and their uses in my house. I went through all of my scrapbook supplies and have a big pile of things I either need to give away or sell. I bought them and I just know I won't end up using them. Time to let them go and the guilt that I spent the money on them. It really helped to narrow all of that down. On the next shelves, I keep some of my business books and reference materials. I also keep my overflow of cookbooks as the kitchen is just around the corner. Mr. T works from home so he has some space for his files and such as well. We keep our receipts in that cute little basket until the next paycheck at which time we double check things and shred them all. You can see I kept the less pretty things behind the closed doors. Behind those doors are our paper supply, envelopes, extra printer cartridges, laminator, etc. I also keep our warranty and product information binders in there. Those binders contain all those booklets you get with products. I wish there was a more modern way to keep them electronically, but I haven't found that yet. Let me know if you know of such a thing…I would love it! Moving over the the old T.V. armoire which has become our craft cabinet, I spent some money here to get bins that would work for our current needs. I didn't really like to spend the money and it ended up being more than I wanted (because I am cheap), but it has really been worth it, so now I really think it was money well spent. I really need to get these labeled, but haven't gotten to it yet. Another project for another day! One of the biggest tips or ideas I have for you here is that if you have kids, get them each their own bin for their own special art supplies. In the past, they each had a shelf. It didn't work. They would shove all kids of things in there. Now, we have a rule that they can't keep anything other than craft supplies in those baskets/bins. What is in their bin is theirs only and their sister has to ask before she uses it. 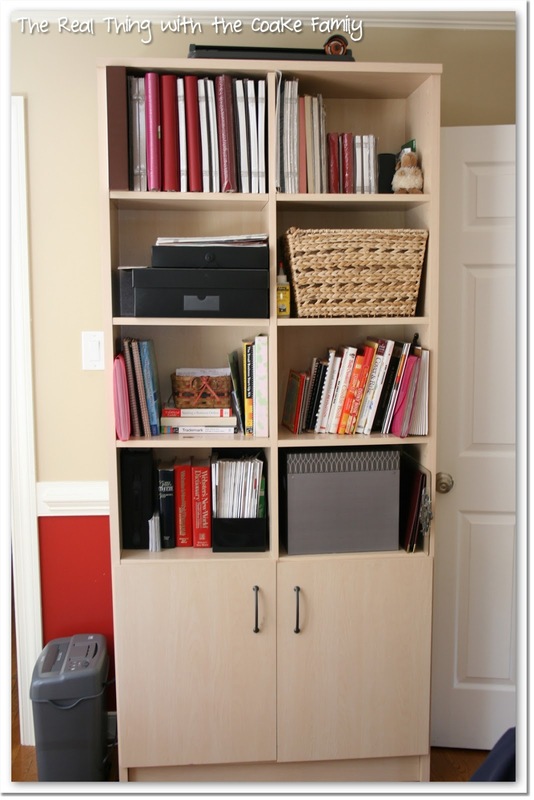 When they have created a project or art, it does not go in here, they have an art box or a cork board on which they can store or display their creations. 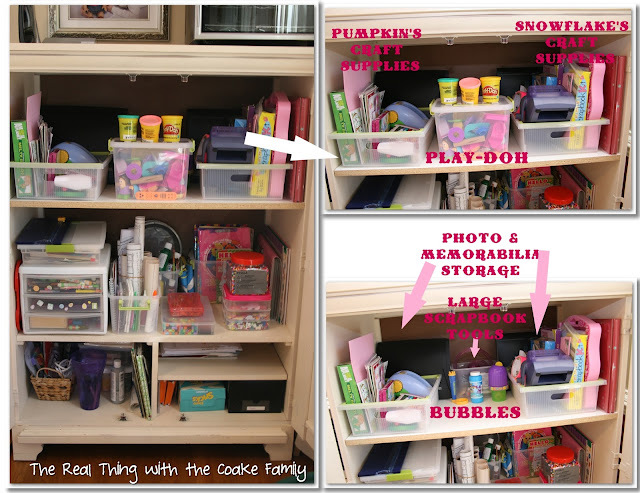 I utilized the deep armoire storage by buying bins to make it easy to get sets or groups of things out and be able to use the whole space. On the top shelf, I used the back area as storage for my additional photo and memorabilia as well as my large scrapbook tools. 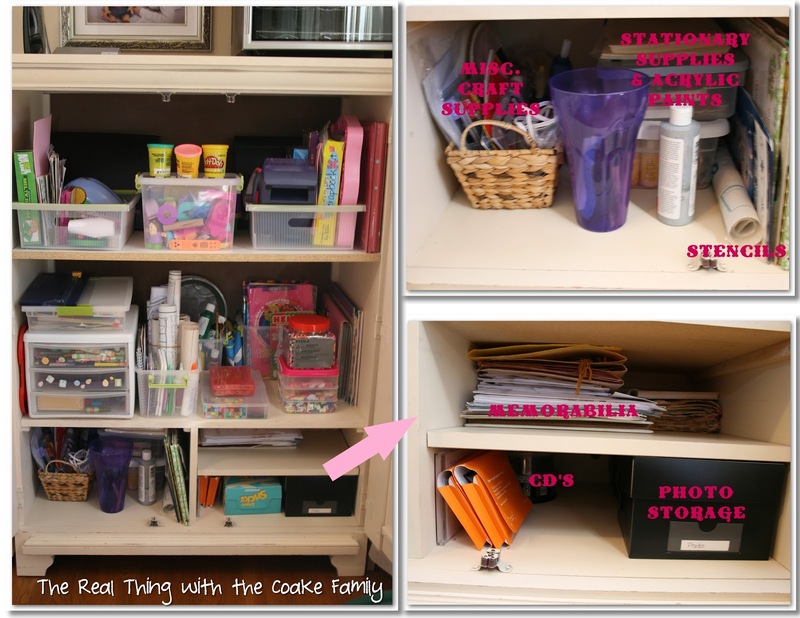 They are not used often and are not in the kids way, so it works well to use the back space of the cabinet for this purpose. On the second shelf, I utilized bins again to help be able to use the full depth of the cabinet, while making it easy to reach things and put them away where they go. I think I labeled things well above so you can tell what is what. If you have any questions, please feel free to leave me a comment below. Some details from the second shelf. 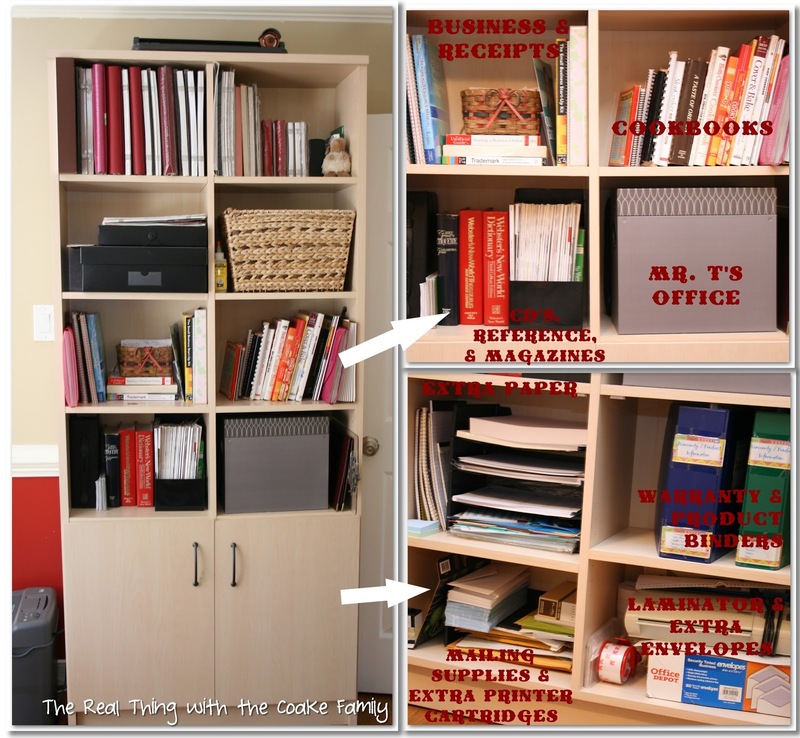 You can see how we use our 3 drawer organizer. Using these rectangular bins worked so well. As you can see, I was able to fit our rolls of paper in one with glue and the Perler bead forms. It might seem like a strange grouping, but it works for us. I also added the cute little 3 level bin to hold their foam stickers and extra cuts from my Cricut. The bottom shelf is my area. On the left side, I have my additional craft supplies. Most of these used to be in a large basket on top of the other cabinet. It was really heavy and hard to get up and down as I needed things. This is working so well! On the other side, I have more memorabilia (and hope to some day turn all this memorabilia and photos into even more albums than I have already completed!) and photos as well as the archival CD's of photos. Doesn't it look great! We need some inspiration and artwork for the message board, but I am sure if I asked my girls it would be full in 10 minutes. Just haven't asked yet, kind of enjoying the openness and blank canvas at the moment. The craft cabinet…doesn't it look fun! Our new office/grown up cabinet…doesn't it look peaceful and easy to find things? 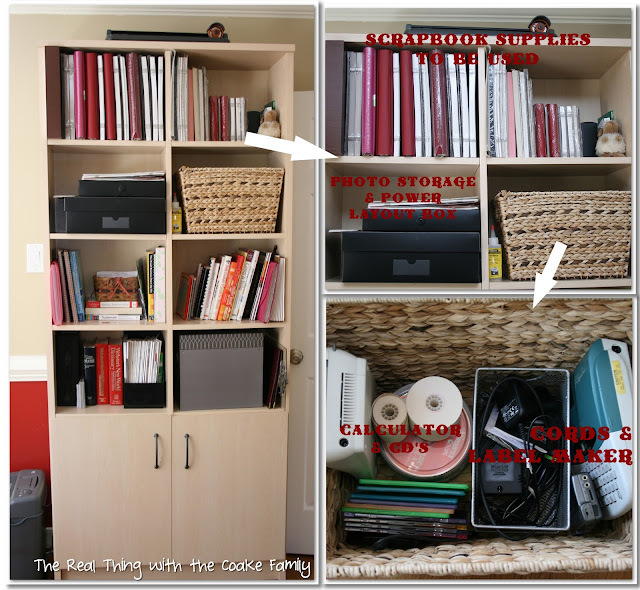 It just makes me happy…yes I am an organizing dork! I'm so happy with how I re-organized things this year. It is working really well for us. It is so nice to walk by the room or be in the room and not have mess staring at me all the time. Although with all the crafts my girls create it still is usually a huge disaster, but at least I know we can put it away and we know where things go. Hope I was able to give you some ideas or tips for your own organizing. 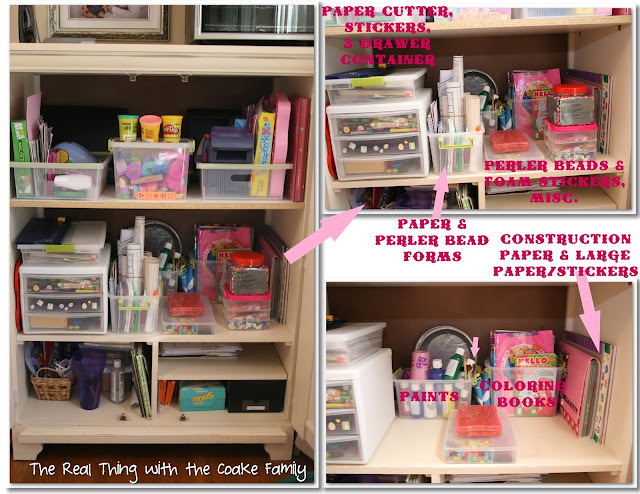 What do you do with all your kids craft supplies? or how do you organize your office stuff? Anyone have a digital way to keep manuals and warranty information? All of those items are so hard to look organized when you have so many of them. Great job! I hadn’t really thought about that until I saw your comment, but maybe that is why what I did in the past didn’t work. 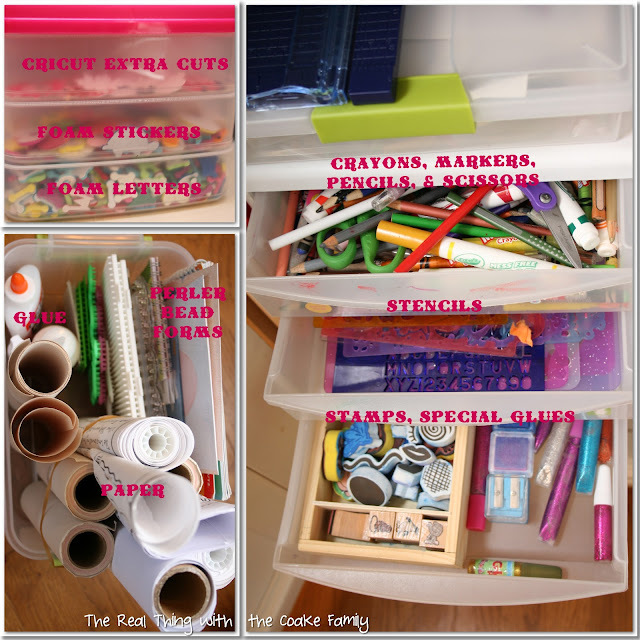 I hadn’t wrangled all those crafty items into bins and they were too hard to get organized. Thanks for stopping by. Will you come do that at my house? Puh-leeze! I think you are right, I will use and re-use those bins over the years. This year, I even started a bin with bins in it so I have some on hand and can pull from those that aren’t being used currently. That might be stepping into the obsessive category, though. LOL! Thanks for hosting the link party! Have a great week. I have to be organized because in Paris, flats are tiny compared to houses in USA and in London, we live at a hotel. You are welcome! You made my oldest daughter so excited. She is currently in love with anything Paris…she was excited that someone from Paris had visited my blog. Thanks for stopping by! Wow, it looks so great! I cracked seeing your picture with everything in the middle of the floor and one of your children sitting at the desk totally oblivious to the chaos! My kids are grown, so in my case, it would be my hubs! Thank you! Yes, that picture cracks me up as well. She really was working to find a place to make whatever she was working on. This was the worst room to both girls to have unavailable for a while…even worse than not being able to get into the playroom. They love their crafts! Looking good! I know your girls are loving their big table!! Have a great week! Thank you! Yes they are loving the taller table. They spend so much time crafting it has been a nice change for them. It actually doesn’t take long, and saves a heap of space at our place! Thank you for your idea. I do have a scanner, I just can’t imagine that it would be a quick process. It sounds like torture. 😉 I know you said it doesn’t take that long…so I may give it a try. Your welcome! Thanks for hosting the party! I really, really, really don’t like to organize anything. I know some people (my cousin) loves to do it… I wish I did. My craft room is disastrous! but, the good news is I can always find what I need. Great job with your reorganization! Thanks! I do like to organize things…but you know if you don’t like it AND you can always find what you need, I’m not sure what the point would be. It would probably mess up your system! lol!